The Soccer Hall of Fame is pleased to welcome in the 2012 Induction Class, comprised of four Players, two Builders, a Pioneer Award Recipient, a Team and Organization of Distinction. This year, the Soccer Hall of Fame Induction Ceremonies will take place in Toronto on the June 2-3 weekend. More details on the weekend events will be available on a later date. The 1989 Francophone Games Canadian Men's Team will go in as the Team of Distinction, 23 years after their Gold Medal victory. The Canadian Men's team under extreme conditions went on to make soccer history by winning the Gold Medal at the first Francophone Games held in Morocco in 1989. Canada played its first two games in Mohammedia beating Burkino Faso 3-1 and playing to a scoreless tie against the Ivory Coast. With the tie Canada qualified for the semi-final against Congo defeating the Central African nation 2-1 before 20,000 fans in Casablanca. Canada went on to defeat the home favourites Morrocco in the final with a score of 4-1. Played 129 times for Canada, voted Canada's Female Player of the Year in 1994, 1995 and 2002. Played 59 times for Canada and was a member of Canada's CONCACAF Gold Cup winning team in 2000. Played 78 times for Canada between 1991 and 2004 making his full international debut against Honduras. His lengthy club career took him back and forth between North America and Europe. Played 132 times for Canada. Played in 4 FIFA World Cups. Angus has been involved in soccer for more than 45 years representing both the Newfoundland and Labrador and the Canadian Soccer Association. Long time referee in the NASL. On Canada's FIFA list from 1982 - 1991 and officiated at the Canadian Soccer League Final in 1988 and 1991. Long time B.C. Administrator as secretary of the B.C. Soccer Commission a position he had held since its inception in 1933. He was also a council member of the Dominion Football Association from 1948 until his death. Victoria West - Formed in 1896 and won numerous provincial championships. They were national champions in 1976, 1979, 1982 and 1984. The 1989 Francophone Games Gold Medal Winning Canadian Men's Team The Canadian Men's team under extreme conditions went on to make soccer history by winning the Gold Medal at the first Francophone Games held in Morocco in 1989. Born: Georgetown, Guyana, Jan 15, 1968. Clubs: Nepean Hotspurs, Lynwood Spirits, Donna F.C. (Viggo Helevig), Atlanta Beat, Chicago Cobras, New Jersey Wildcats. Charmaine was a world class player and arguably the finest female player, ever produced in Canada and she has become a legend in her own time. She grew up in Nepean near Ottawa and began playing soccer when she was twelve years old in 1980 and later moved to the U.S. and attended North Carolina State University. She made her national team debut in 1986 against the U.S. in Minneapolis and from that day on she became both the face and the persona of the team. In her 129 games for Canada she scored 71 goals. Voted Canada's Female Player of the Year in 1994, 1995 and 2002. In 1999 she was selected to the FIFA Women's World All-Star team that played the world champion U.S. team and was voted the games MVP. FIFA has always admired her ability, both on and off the field and in the past year she was appointed to the FIFA Task Force 2014 a group that includes many of the legends of the game. Born, New Westminster, British Columbia, December 25, 1971. 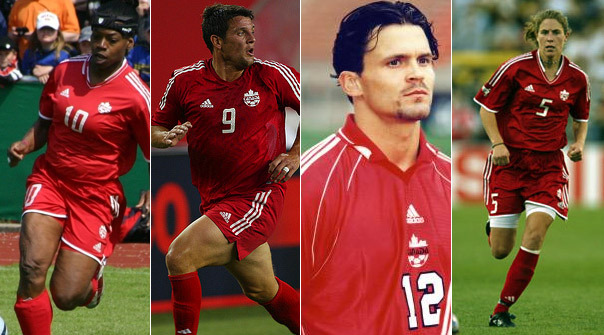 A member of Canada's CONCACAF Gold Cup winning team in 2000, he played 59 times for Canada and scored 11 goals. Carlo began his professional career with Winnipeg Fury of the Canadian Soccer League in 1992, before moving to England to join Cambridge United of the Football League at the start of the 1993-94 season. At Cambridge he played in 105 games and scored 39 goals, before being transferred to Plymouth Argyle in April of 1996. At Home Park he scored from the penalty spot on his debut, finally appearing in 74 games and scoring 22 goals. He moved on to Northampton Town in 1998 and helped them win promotion from the old Third Division to the Second in the 1999-2000 season scoring 15 goals. He ended his English career which stretched from 1993 to 2003 with Oldham Athletic appearing in 367 games and scoring 111 goals. He returned to Canada at the end of the 2002-03 season to play for the Vancouver Whitecaps of USL. Carlo made his national team debut against Morocco in 1994 and was the top scorer in the 2000 CONCACAF Gold Cup with four goals including a penalty in the final against Colombia. Early in his career in 1989 tried his luck in Italy with Giorgioni Club Calcio. Born, Vancouver B.C., Sept 7, 1970. Mark made 78 appearances for the national team between 1991 and 2004 making his full international debut against Honduras. His lengthy club career took him back and forth between North America and Europe and it began in the Canadian Soccer League starting in 1990 with Ottawa Intrepid, then moved on to Hamilton Steelers in 1991 and Montreal Supra in 1992. He returned home to the west coast with the Vancouver 86ers of the A-League for 1993, then crossed the Atlantic that fall and played 18 games for Watford of the Football League in the 1993-94 season and one at the start of 1994-95. He was back in North America playing for Columbus Crew and New England Revolution in MLS in 1996, then with Seattle Sounders of the A-League in 1997. That fall saw a move back to Europe again with Osters of the Swedish league where he played 25 games in 1997 before going back to England with Oxford United and Oldham Athletic from 1998 to 2001. In the summer of 2001 he was with DC United in MLS then to Charleston Battery of the United Soccer League from 2002 to 2004. In 2005 he was back in Vancouver with the Whitecaps and ended his playing career in Charleston in 2006. On retiring as a player he turned to coaching and more recently was an assistant coach with the San Jose Earthquakes of Major League Soccer. Born, Vancouver, B.C., October 26, 1971. Andrea made her national team debut in 1991 against Jamaica in Haiti during the CONCACAF championships and went on to play 132 times for Canada. She played in the 1995 Women's World Cup in Sweden, the 1999 and 2003 in the United States and 2007 in China. She also played in the CONCACAF Gold Cup in 1991, 1994, 2000, 2002 and 2006 in the U.S. and the Pan American Games in Brazil in 2007. She earned her 100th cap against Germany on April 21, 2005 and her 132nd against Ghana on September 15, 2007 in Hangzhou, China. She spent 18 years in the women national team program and six years with the Vancouver Whitecaps. She became the first female soccer player to be inducted into Canada Sports Hall of Fame when she was honored in Calgary in 2011. During the 2009 Canadian Soccer Association annual meeting in Calgary, Angus Barrett was named recipient of the prestigious Aubrey Sanford Meritorious Award for his outstanding commitment to soccer in Canada. Angus has been involved in soccer for more than 45 years representing both the Newfoundland and Labrador and the Canadian Soccer Association, serving on a number of committees and been a Canadian Soccer Association executive member since 2000. At the time the Sanford award was presented Doug Redmond, Newfoundland and Labrador provincial president said called Barrett "one of the most respected people within soccer, especially at the national and international levels." An extremely beneficial and active member of the Newfoundland and Labrador soccer community for nearly 50 years, he was a fine player, a respected and fair official and a knowledgeable and dedicated coach. Well-known and highly respected across Canada, his soccer activities have been especially beneficial within Newfoundland and Labrador and have been very, very valuable to the sport at the national and even international levels. At the local level, his efforts have been extremely important in Mount Pearl and in St. John's. He led youth teams to provincial titles in all age categories, at the 1992 provincial summer games and at the junior level. He was president of the Newfoundland and Labrador Soccer Association from 1995 to 1999, and at the Canadian Soccer Association level represented Canada in Morocco, Chile, Argentina twice, the US Virgin Islands, Spain, Turkey, the United Arab Emirates, Honduras and in the United States. He chaired the important competition committee of the Canadian Soccer Association for six years and represented the Association on the Canadian Olympic Association for five years. Born in London, England of Scottish parents. Gordon started refereeing in Scotland in 1965 and brought five years of experience with him when he emigrated to Canada in 1970. He took up refereeing here in 1972 and soon achieved national recognition. He began refereeing in the North American Soccer League in 1981 and was appointed to the FIFA list in 1982. His international experience includes the President's Cup in South Korea and numerous other internationals. He was on the FIFA list for ten years and officiated at the Canadian Soccer League Final in 1988 and 1991. Born, Washington, County Durham, England, 1900. Died, Vancouver B.C. Oct 5, 1952. Earned his law degree at the University of Edinburgh and came to Canada in 1919. Played for some years after coming to Canada but turned to administration and at the time of his death was secretary of the B.C. Soccer Commission a position he had held since its inception in 1933. He was also a council member of the Dominion Football Association from 1948 until his death. Inducted into the British Columbia Sports Hall of Fame in 1966.
of the Victoria and District Soccer League 16 times. However, their greatest achievement was in winning the national championship four times. They were national champions in 1976, 1979, 1982 and 1984.
prestigious World FIFA Francophone Games Championship in Morocco, Africa. On July 22, 1989, The Canadian Men's National Team made soccer (football) history as they defeated the odds on favorites Morocco by a score of 4-1 in the Francophone Games Final in Casablanca, Morocco to become the first 1989 Fifa Francophone Games World Champions. The Francophone Games victory of 1989 was full national team. The Canadian National Men's team walked into an international final championship match facing off against the home country favorite Morocco. Canada had scored 4 goals by halftime in front of a rabid partisan crowd of over 70,000 in Casablanca, Morocco. Goals scored by Lyndon Hooper (14th) Rick Jasken (28th, 32nd) and Kevin Holness (44th) gave Canada a three goal lead at the half, the lone goal scored by Morocco was Moumaris at the 40th minute. The very proud Gold Medal Winning Canadian Men's National Team (Francophone Games Champions): Front Row left to right: Rick Jasken, Kevin Riley, Rob Merkl, Carlo Corazzin, Lyndon Hooper, Norm Odinga, Rob Csabi, Dominic Mobilio. Back Row left to right: Shel Brodsgaard, Kevin Holness, Peter Sarantopolous, Nick Gilbert, Patrick Diotte, Peter Gilfillan, John Paul Knesovic, and Enzo Concina (Team Captain) Note: Missing on this Francophone Games Gold Medal Winning Canadian Men's National Team Championship team picture is goalkeeper Craig Forrest and defender George Mersic. Both played on this championship winning team in the early stages of this competition. Particularly goalkeeper Craig Forrest was outstanding in the games he played in the early rounds. 1989 Francophone Games - Canadian Men's National Team's Staff: Bruce Twamley (Head Coach); Les Wilson (Manager/Assistant Coach); Kevin Muldoon (Goalkeeper Coach); Francis Millien (Technical Assistant/CBC French Television Analyst); Dr. Rudy Gittens; Head of Delegation Guy Burelle; Minster of Sport - Canada: The Honorable Jean Charest.Canada 3 - Burkina Faso 0 Canada 0 - Cote d' Ivoire 0 Canada 2 - Congo 1 (Semi Final) Canada 4 - Morocco 1 (Championship Final) France 2 - Congo 3 (3rd and 4th Place).